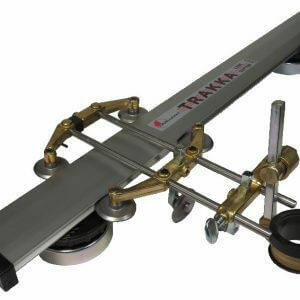 The Trakka Line Cutter is the ultimate package for the professional severe metal fabricator. Trakka line cutter is ideal for repetition straight cutting and bevelled edge preparation. The Trakka Line Cutter have a precise internal profile fit to your torch. Just select the Torch Brand/Model from the list, and a matching item will be displayed (Part No’s TJ5085H1A to TJ5085H3Z). Now, go ahead and click on the Thumbnail Picture to open the full product page. The bushing/sleeve/holder combination is factory fitted and supplied with the Trakka Line Cutter package selected. The Trakka Line Cutter is shipped in a compact pack including two rails of 800mm (32″) each and Alloy Joiner to make a full 1.6m (63”) length, allowing a run of 1.5m (59”) on plate cut. The magnetic locking bases can be released by rotating wheel clockwise ¼ turn. The rotation consequently allows us to increase the cutting length by sliding the alloy rail along the released magnetic base. Also, the Holder Arm can be swung outward and adjusted for height to enable beveling or inward for kerf angle correction. Additionally, with the help of a TJ5260 Joiner, we will be able to join the rails for a long seamless track. We can also add TJ5250 Magnet Base to each rail extension to provide support at every 1.2m (4’) intervals. Additionally, cutting on alloys or stainless material requires using TJ5280 Suction Plates under the TJ5250 Magnet Bases. To know more details with on the product click the “How-to-Use” button and Picture Gallery. In between uses the handy Magnetic Base allows us to park Trakka on any suitable steel surface like an upright beam or column. Tanjant’s Trakka Line Cutter eliminates drag related tip damage, giving a significantly increased cutting tip life. What Tanjant can promise is that the savings in cutting time and effort will deliver real benefits well into the future.